Lucky Club, the popular NuWorks Gaming powered online casino, has released an exciting new slot game, titled Bank Bandit that will see players finding that “crime” does actually pay. 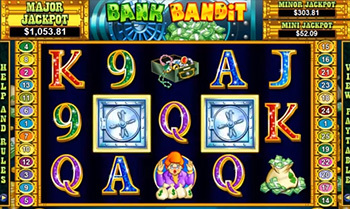 Bank Bandit Slot is a 25 pay line bank robbery themed slot game that features fantastic cartoon graphics, lots of free spins as well as animated “Vault” Scatter symbols and “Robber” Wilds that result in free games being triggered offering huge payouts of up to 16x the triggering bet. According to Alex Hunter, Manager of Lucky Club Online Casino, players know that something special is about to happen in the Bank Bandit slot game when animated symbols appear. Hunter added that by “special” he means free spins and that the Robber symbol triggers the Robber Feature that will see players receiving 20 free games while the Vault triggers between five and fifteen free spins. A progressive jackpot attached to the Bank Bandit slot game starts at just over $1,000 and also features Minor and Mini random jackpots. The Monster Millions slot game at the online casino also offers players a progressive jackpot that currently stands at an amount of over $1,007,000. Greek Goddess, Duck Ages and African Skies slot games are all linked to one jackpot that is currently approaching an amount of $100,000. Players will find dozens of NuWorks casino games at the online casino that include video slot machines, video poker games such as Decues Wild, Joker Poker and Jacks or Better as well as table games such as Blackjack, Baccarat, Tri Card Poker and Let ‘em Ride.